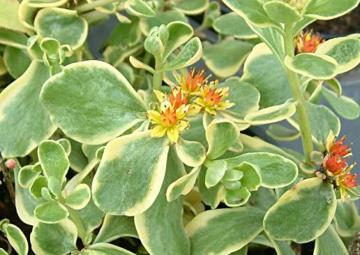 Small rock plant with striking cream variegated foliage, often with pinkish highlights, setting off the small star-shaped flowers which are red in bud opening to yellow..
Well drained, neutral to alkaline soil in full sun. Will tolerate some shade. Suitable for rock and scree gardens, alpine gardens and troughs.